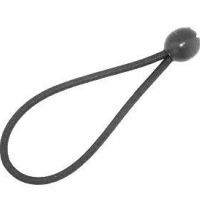 Looking for bungee shock cord loop ball ties, then look no further. Our bungee loop ball ties are made from 6mm black bungee shock cord which are then looped and fitted to a large 25mm diameter plastic ball. These plastic balls are made from a impact resistant, thick cast plastic. Ball and loop bungees are widely used to secure tarpaulins, banners, gazebo's, tents, trailers, marquees sides to frames, market stalls to frames & boat covers. They can also be used to secure rolls of fabric, sheeting, canvas and also as sail tidies. Sizes are 6mm x 180mm and 6mm x 250mm.